DS Arms is proud to offer this "gunsmith" Glock slide. These slides make for the perfect affordable start to YOUR OWN custom Glock build! These slides are machined from 4140 Pre-Hard Steel. All of the internal geometry and machining is complete. 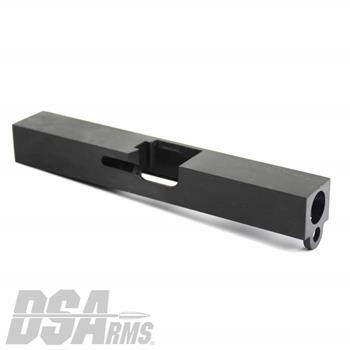 There is no profiling, machining, serrations or cuts for the sights on the exterior of the slide. Additionally these slides have a phosphate finish on them. Pre-Installed and included with the slide is the Firing Pin Channel Liner.